The Melt pendant lamp by Tom Dixon is a suspension lamp in the shape of a distorted globe produced in a vacuum process. The form of the luminaire is reminiscent of a bubble or a bubble in the water that could burst any second. Together with the design collective Front, Tom Dixon developed a light that is translucent when switched on and shows its mirror finish when switched off. Its internal luminosity is also visible in full daylight. The lampshade of the Melt light is made from polycarbonate with copper, chrome or gold plating. 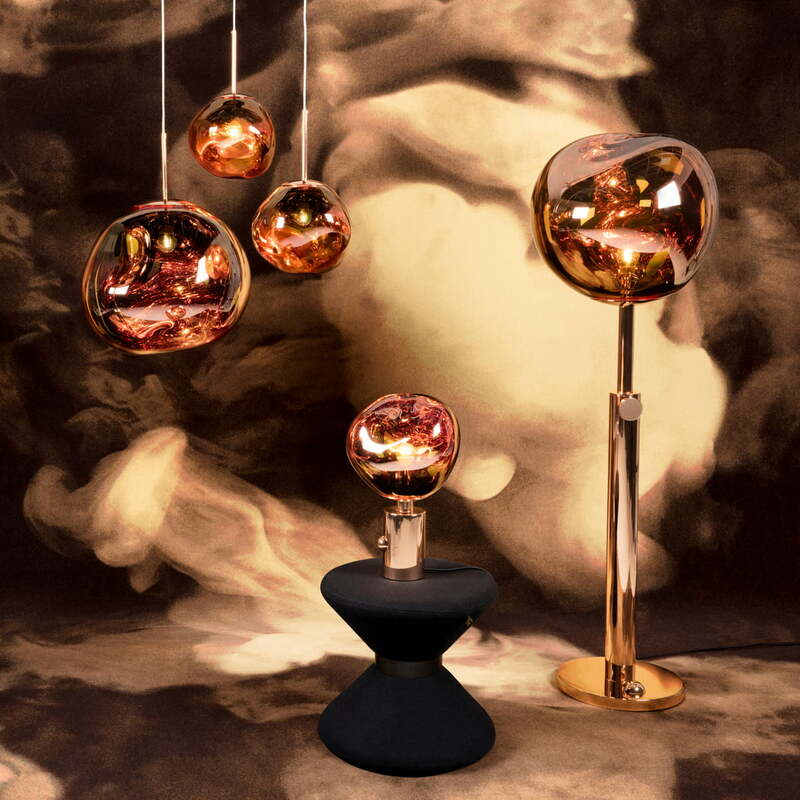 The Melt Pendant Lamp by Tom Dixon is available in different versions in copper, silver and gold. A mini version of the luminaire is available as well. 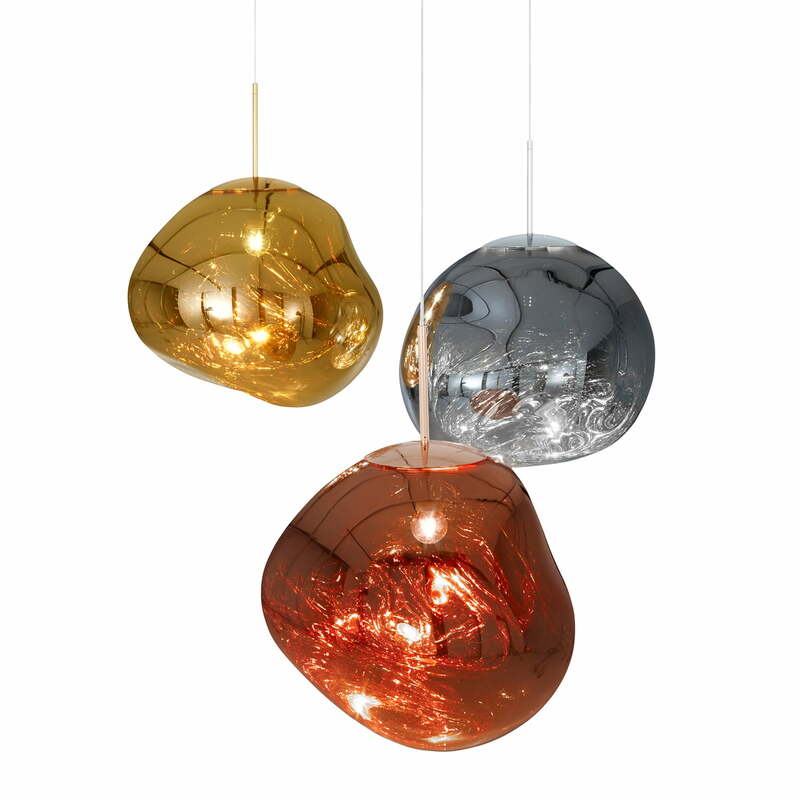 Individual product image of the Mini Melt pendant lamp by Tom Dixon in chrome. 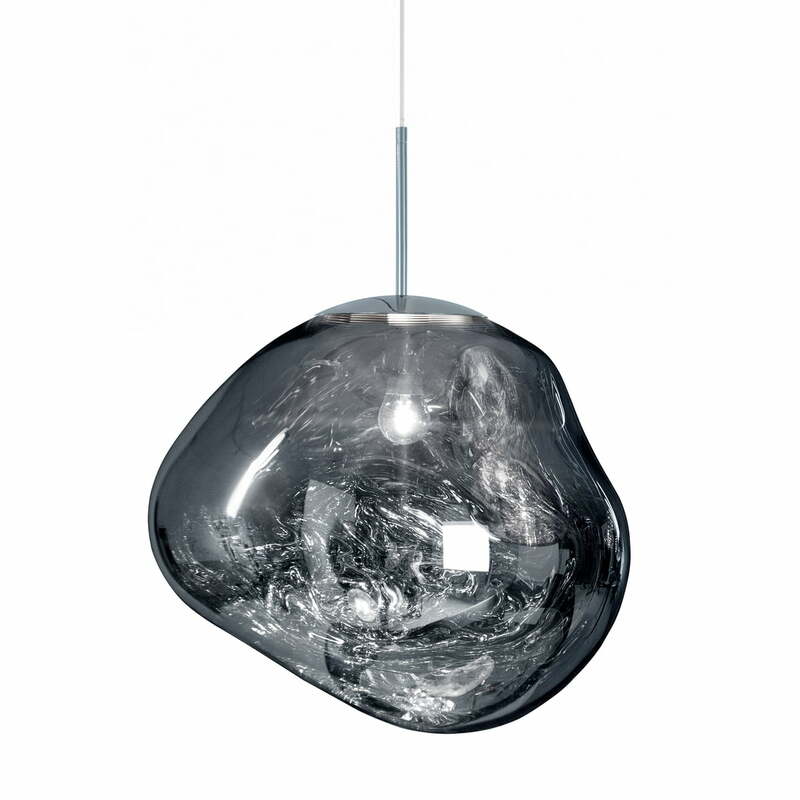 The Melt pendant lamp by Tom Dixon is a pendant lamp in the shape of a distorted globe, produced in a vacuum process. 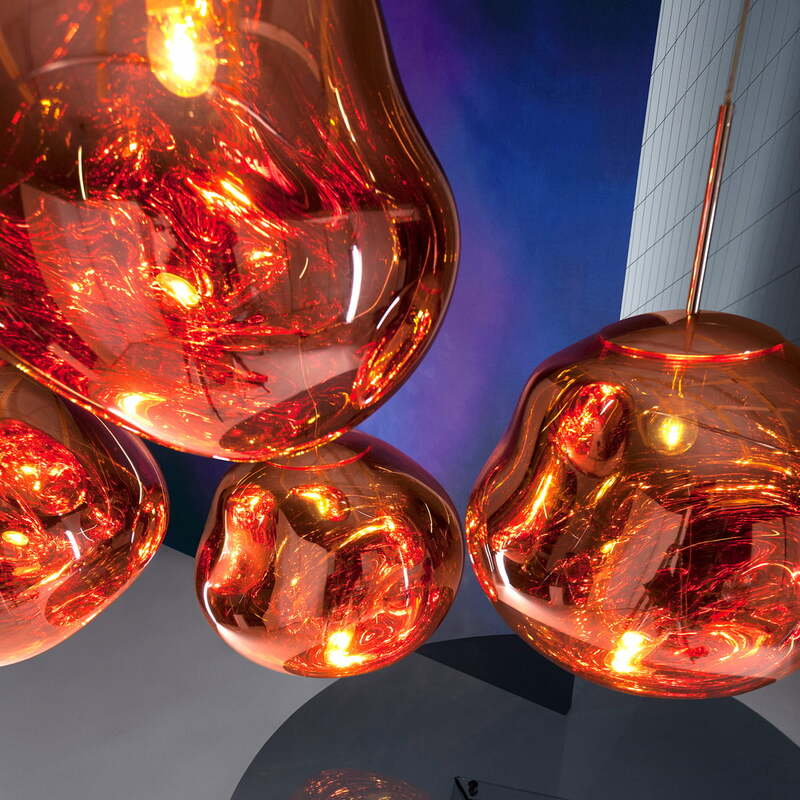 Group image of the Melt Pendant Lights. The lampshade of the Melt pendant lamp by Tom Dixon is made from polycarbonate with copper, silver or gold plating. 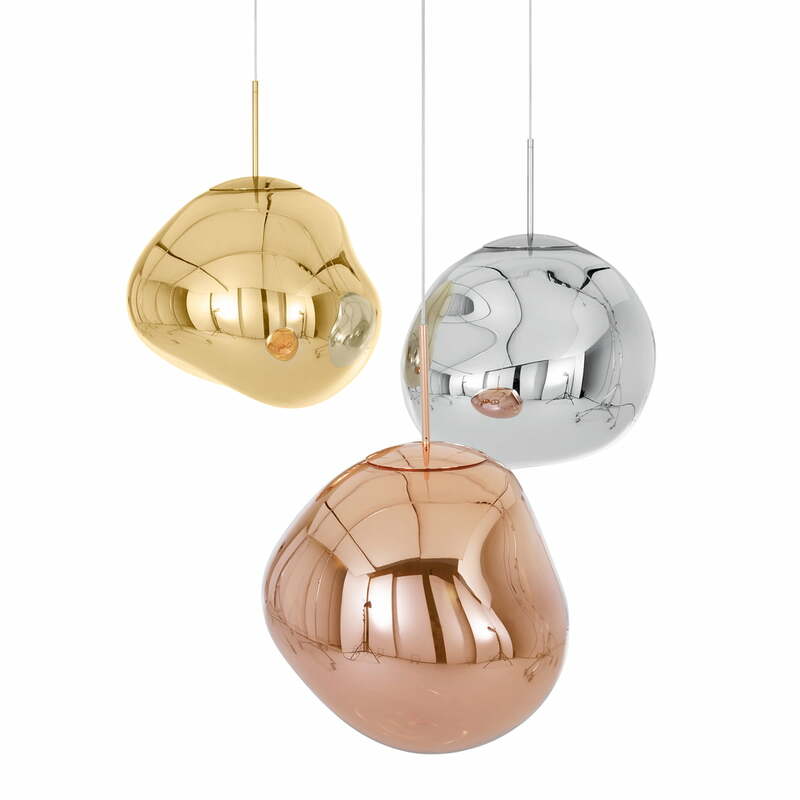 The Melt Pendant Lamp by Tom Dixon is available in different versions with coatings of copper, silver and gold. A mini version of the lamp is available as well. 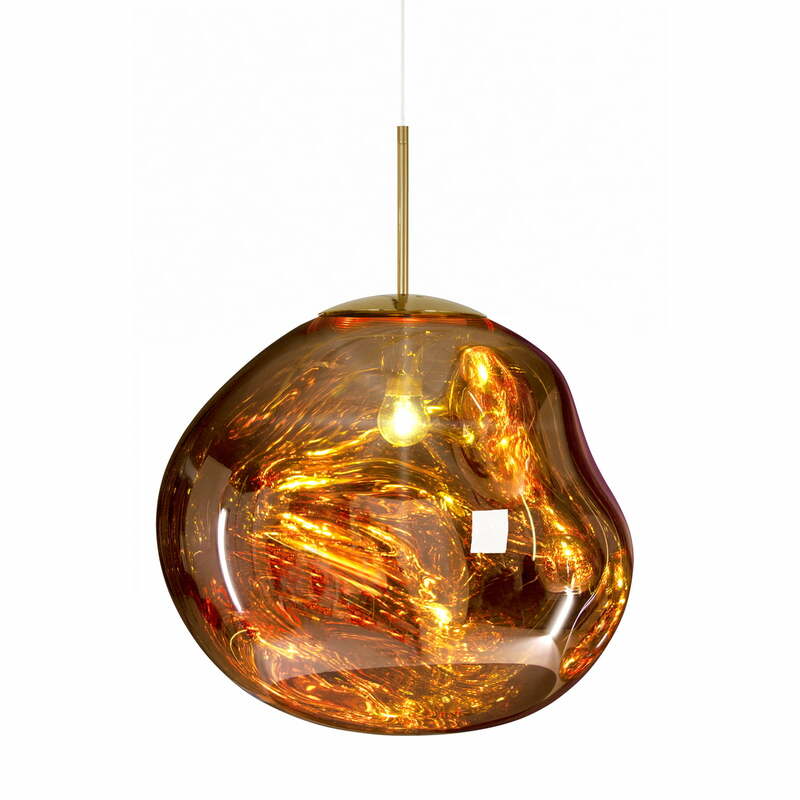 Individual product image of the Melt pendant lamp by Tom Dixon in gold, switched on. When the lamp is switched on, the mirror finish on the lampshade becomes transparent. 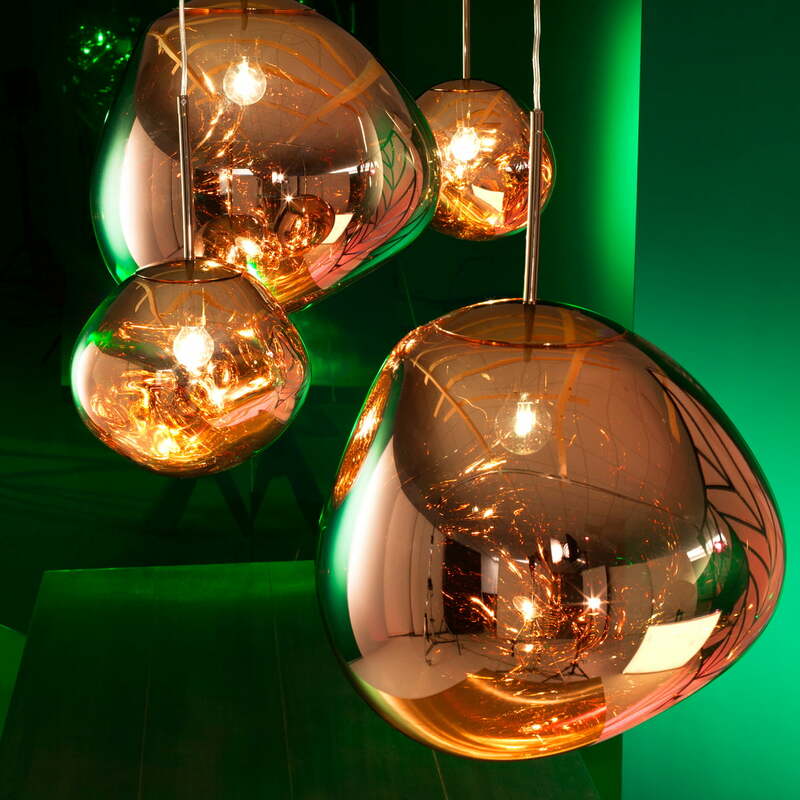 Individual product image of the Melt pendant lamp by Tom Dixon in copper. 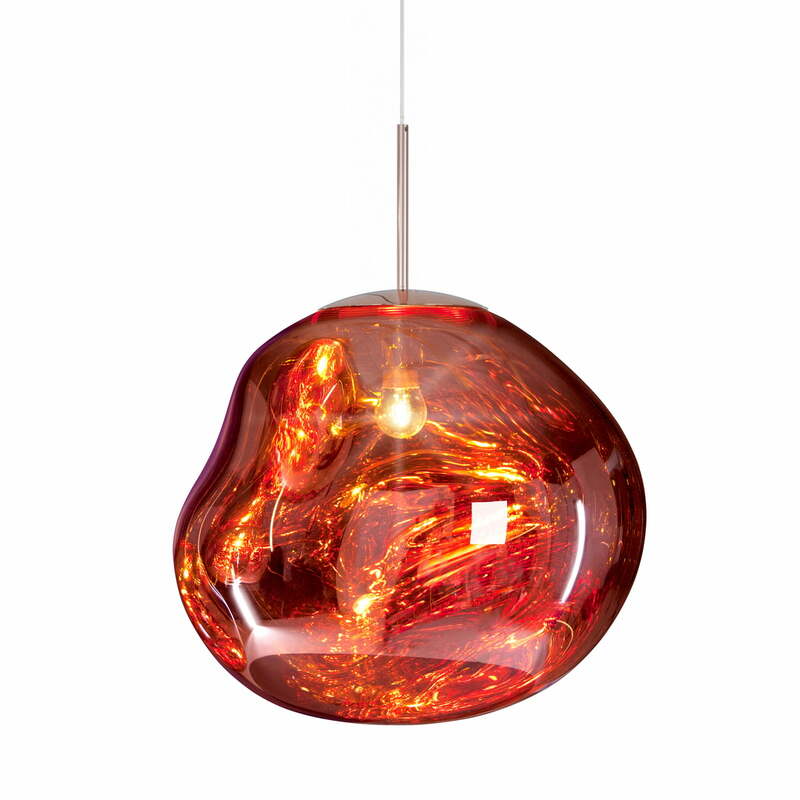 When switched on, the Melt pendant lamp in copper displays its full flaming effect. 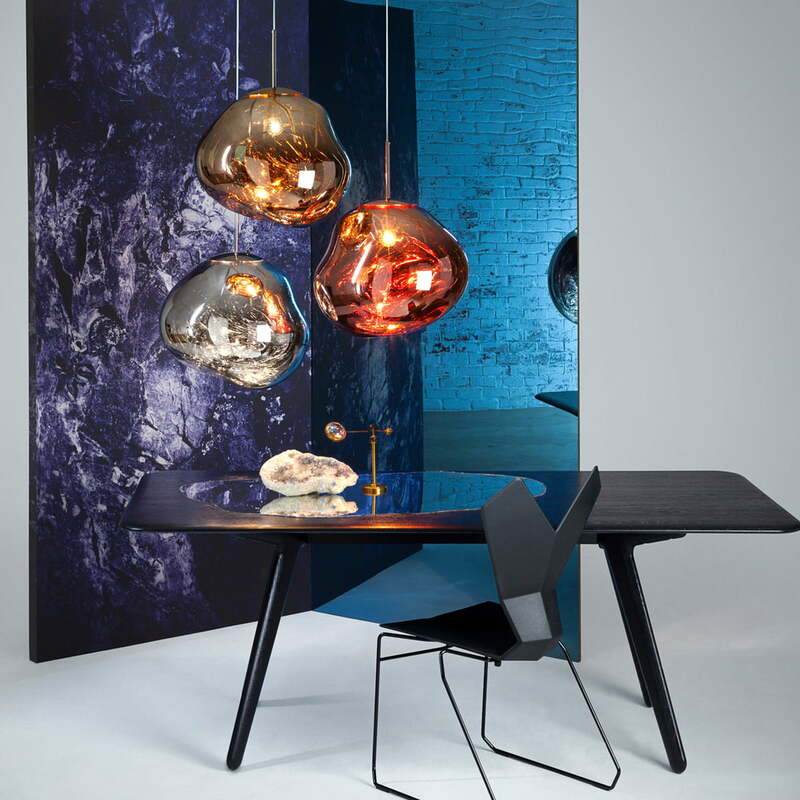 The Melt pendant lamp by Tom Dixon is a pendant lamp in the shape of a distorted globe, produced in a vacuum process. The shape of the lamp is reminiscent of a soap or air bubble in water that could burst at any moment. Together with the design collective Front, Tom Dixon has developed a light that is translucent when switched on and shows its mirror finish when switched off. The internal luminosity of the Melt pendant lamp is also visible in full daylight. The lampshade of the Melt light is made from polycarbonate with copper, silver or gold plating. 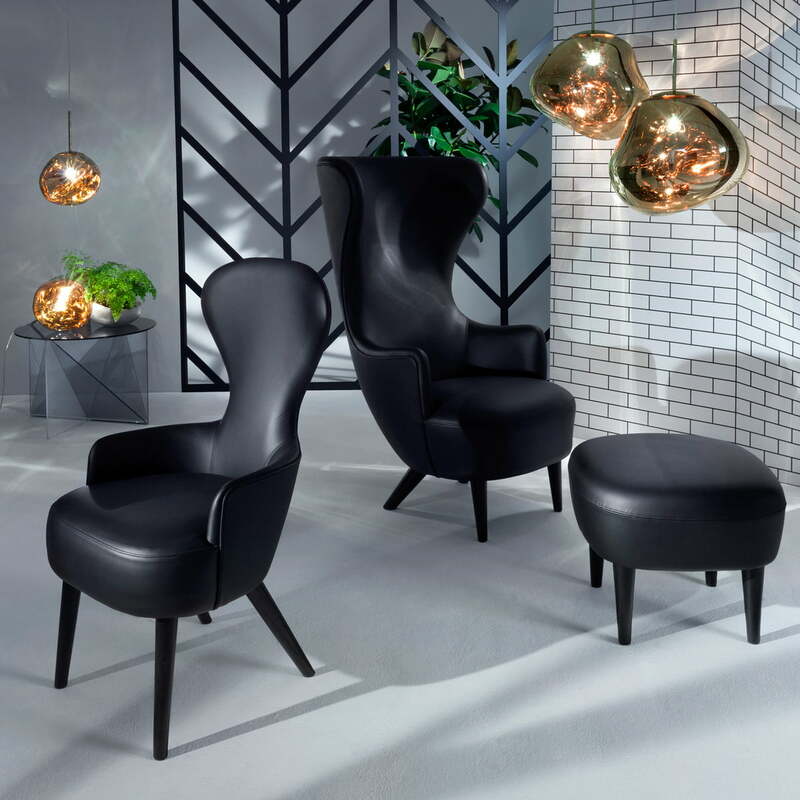 The Tom Dixon - Melt lamps in copper - floor lamp - table lamp - pendant lamp in group view The lamps get their distorted shape from a vacuum process.